Head Coach Frank Solich enters his 14th year with the Bobcats with a career record of 97-71, fresh off of a 9-4 (5-3 in conference) year in 2017 where the Bobcats were just a game back from Akron in the MAC East title race. QB Nathan Rourke stepped out of nowhere last season, beating out expected starter Quinton Maxwell for the job and throwing for 2,203 yards with a 17-7 touchdown to interception ratio, adding another 912 yards and 21 touchdowns on the ground. 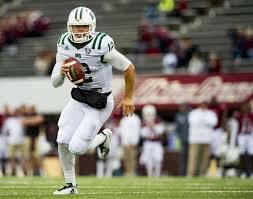 With Rourke at the helm, the Bobcats ranked 9th in the country in ppg (39.1) and 16th in rushing ypg (244.5). With a year of added experience for Rourke and almost everybody around him returning, this team could improve on those numbers in 2018. The defense is quite a different story. After giving up just 24.2 ppg last season, this half of the team loses all but one starter from the front seven. The defensive line, which loses all four starters, may take a big step back after helping the Bobcats lead the MAC in opponent rushing ypg last year (110.5!) but a lot of the projected starters had playing experience in backup roles, so it won’t be the massive drop off you might expect. The linebacking core will take a hit too as they lose their two best players, although returning WLB Evan Croutch looks to pick up the slack after 70 tackles last year. The secondary should be rock solid as they return three out of four starters including the best safety combo in the conference in Javon Hagan and Kylan Nelson, who combined for 138 tackles and 15 PBU’s last year. The schedule shapes up nicely, as they avoid Toledo from the West and get both Bowling Green and Buffalo at home. This team will contend for ten wins. After two MAC titles and two double-digit win seasons in a three-year span, Dino Babers got hired away to the power five (Syracuse) and the Falcons brought in Texas Tech assistant Mike Jinks to replace him. Jinks has gone just 6-18 in his first two seasons with the Falcons, and had to bring in a new DC in Carl Pelini (formerly DC at Youngstown State), but with the team recruiting near the top of the conference, you can see improvement in the distance. Jarret Doege is expected to get the start at quarterback after throwing for 1,381 yards, 12 touchdowns, and three interceptions in four starts plus playing time in a handful of other games last year as a freshman. Andrew Clair returns at running back after racking up 725 yards on the ground as a backup, and BGSU returns a pair of starters in the receiving core as well as four of their top six. That group is headlined by All-MAC WR Scott Miller (722 yards, four touchdowns LY). With a handful of starters returning and two impressive young sophomores in the backfield, I expect some improvement from this side of the ball. The defense was not good last year, ranking 123rd in the nation in opponent ppg, and 126th in opponent ypg. As I mentioned, former FAU head coach and Youngstown State DC Carl Pelini has been brought on to try and right the ship. Most of the starters return from last season, but the linebacking core will need to rely on a pair of JuCo transfers in WLB Hassan Belton and MLB Brandon Pierce. Overall, with a slight improvement expected on both sides of the ball, a fairly easy schedule where every home conference game is winnable, and a head coach fighting for his job, I am calling for a bowl this year, including a win over a power five in the nonconference. Buffalo was one of the more improved teams in the entire country last year, climbing from 2-10 to 6-6 (with two one-point losses that could’ve easily made that 8-4). Two-year starter Tyree Jackson managed to throw for over 2,000 yards with a 12-3 touchdown to interception ratio despite missing time last year with injuries. His top target, Anthony Johnson is back after an incredible 1,356 yards and 14 touchdowns. Last year’s #3, #4, and #5 receivers all return as well, and with a healthy QB and one of the best receiving groups in the conference, this team should improve even further from their 28.5 ppg average last season. The Buffalo defense has some big pieces returning after allowing just 24.8 ppg last year, including All-conference LB Khalil Hodge (154 tackles last season, #2 in FBS). The Bulls have a group with tremendous depth as the two-deep is almost 50% seniors. DE Chuck Harris will be the star of the D-Line group after four sacks last season, and the top man in the secondary will be CB Cameron Lewis. I expect some improvement here, and Hodge will play out of his mind again. The schedule honestly isn’t too bad, with an FCS opponent, two G5s and Rutgers in the nonconference, along with most of their easy games in conference at home, this should be a bowl-eligible team again. Head Coach Chuck Martin is squarely on the hot seat after starting 16-33 in his first four years with the Redhawks. Miami was a series of heartbreaking finishes away from a bowl last season (5-7, including four losses decided by five points or fewer). QB Gus Ragland is back after a solid 2,000+ yard performance last year while missing time to injuries, as is all but three of the team’s 1,700+ rushing yards from last season. The star of the offense is WR James Gardner, who is the team’s most likely All-MAC pick after averaging 19.7 (!!) yards per catch last season. The #2, #3, and #4 receivers are all gone, and WR Luke Maycock will need to step into a bigger role after 215 yards last year. With almost the entire offensive line returning as well as their top guy at each of the three skill position groups, this offense should be improved. The defense, which was the better half of last year’s team (24.1 opp ppg) also returns a lot, including eight seniors that are projected to start. Six of the eight from the two deep are back this year on the defensive line, including the nasty DT combo of Doug Costin and Nate Trawick (79 combined tackles, six combined sacks last year). The top tackler from last year is also back in Will Linebacker Brad Koenig (103 tackles) and Koenig could contend for all-conference honors. The RedHawks have two winnable games in the nonconference with Marshall and Army, and they avoid Toledo from the West Division, which is always good. I’m projecting the swings will go back in Miami’s direction this year and they will make a bowl. Akron kind of shocked everybody last year (I had them projected at 4-8), winning the MAC East title after beating Ohio 37-34 in what ended up being the game that decided the division. The Zips finished 7-7 despite an offense that ranked 122nd in ypg and a defense that ranked 104th in opponent ypg, mostly thanks to a terrific +10 turnover margin. Kato Nelson started the last five games of last season at quarterback, throwing for 989 yards and eight touchdowns as a freshman. Nelson has a bright future ahead of him, but around him, the offense looks a little weak as their top rusher from last season is gone along with six of their top seven (!!!) receivers. The #1 guy from last year is the returnee, Kwadarrius Smith (726 yards, seven touchdowns) and they add two transfers. A retiring defensive coordinator means DL coach Todd Stroud gets a promotion. Stroud has a lot of pieces to work with from a defense that allowed 28 ppg last year as the Zips return nine starters. Akron returns five of the six from the two-deep at linebacker including Brian Bell, who will shift over to MLB after playing Will last year. The D-Back group also gets back a lot, including all four starters. The safety tandem of Jordan George and Alvin Davis was one of the best in the conference last year (154 combined tackles, six combined interceptions). This team was quite lucky to make a bowl last year given the stats, and with a lot of new faces on the offense, I don’t see this team making it back to one in 2018, although the number of sophomores stepping into big roles says good things about 2019. After a 2-10 year in 2017, Ken State decided to make a change at the top and bring in former Dino Babers assistant Sean Lewis to run things. Lewis will have his hands full, as despite being an FBS team for decades, the Golden Flashes have never won a bowl, and have only made a bowl twice (1972 & 2012). Lewis signed a solid recruiting class and the future looks bright, but he will take over the #129 scoring offense in the country, so things may look a little bleak for this year. Lewis will try and turn the offense from a rush-based attack to a more passing-centric one like he did while OC at Syracuse. The QB to that is Woody Barrett, a highly touted JuCo guy who will likely fit right into Lewis’ spread style system. There aren’t many places to go but up when you are #128, and I expect that this offense, which also gets back it’s top two rushers, to go up in 2018. The defense was… surprisingly not awful last year for a team that went 2-10. The Golden Flashes let up just over 400 ypg which was good for 77th in the nation last year. The defense returns seven of their top ten tacklers, including ILB Jim Jones who racked up 98 as well as six sacks last season. With the switch to a spread style system, the defense may play more tired, but they should be improved on paper when you take all other factors out. I look for an increase in wins in year one under a new coach for Kent State, and with Woody Barrett still owning three years of eligibility, this team could be a division title contender by 2020.